Summer is right around the corner, do you have your summer reading list ready? Time off from school and work means that you might finally find time to catch up on the new hot book series or to covertly read your favorite guilty pleasure. What’s better than a great book on a hot day? In addition, don’t forget to check out the summer reading programs at your local library (for your kids or for you!). 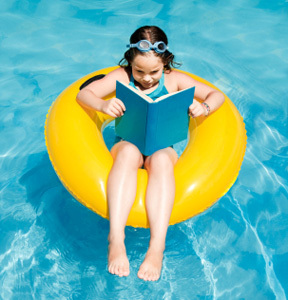 According to the American Library Association, summer reading programs can generate interest in the library and books and can also encourage a lifelong habit of reading. Whether it’s eBooks on your Kindle or paperbacks from the library, from sci-fi to romance to YA or graphic novels, the suggestions below will help you fill your beach bag and will keep you entertained all summer long! Categories: Hours, Library People, Library Services | Permalink.